Join Ore and Ingot for a three day introductory course to learn how to cast bronze using the lost wax ceramic shell process. 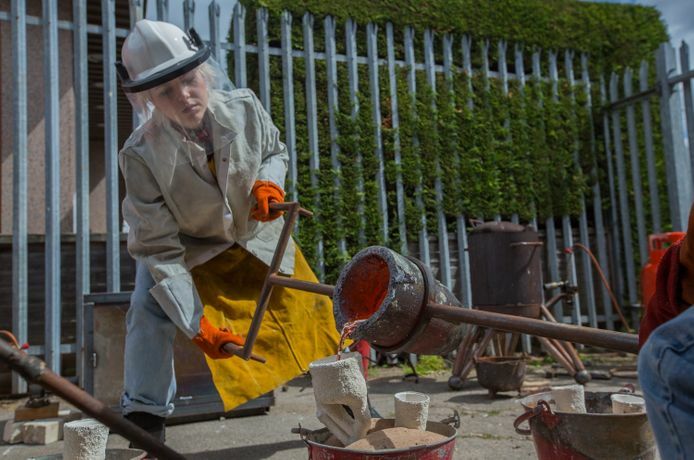 Gain the basic skills and hands-on experience of bronze casting in a safe and supportive environment and leave with a cast of your own. To book please call 0117 9292266, email admin@spikeisland.org.uk or visit Spike Island reception. Two scholarship places are available for those who could not attend without financial support. Support Scholarship is for those who could not attend without the financial support of a scholarship. Spike Island Scholarship is for a Spike Island building user, inclusive of Spike Island Studio Holders, Staff, Cultural Tenants, Spike Associates, Spike Design Tenants, and Spike Print Studio members. Please note: the scholarship will cover costs of the course only and the award holders will be responsible for meeting their own travel costs. Ore and Ingot is a Bristol based travelling foundry, started by Jo Lathwood (Spike Island studio holder) and David Snoo Wilson (Foundry technician at RCA, London) in 2012. Uniquely at the heart of their studio practice is the beautiful alchemy of melting metal. They teach and share metal casting skills in the format of leading short courses, taking commissions and traveling with their portable foundry. Their aim is to create a hub that will draw in local artists and to share skills that are frequently overlooked by art institutions. They are interested in using the foundry to engage the wider community whilst preserving traditional arts in contemporary practice.